DOMO Slate X3G 4th, a new 7 inch Android tablet with 3G and Voice calling support from DOMO is now available for Pre Order. It would Compete with Micromax Canvas TAB P650 and Xolo TAB QC800. Both Micromax Canvas Tab P650 and Xolo Tab comes with quad core processor, 1GB RAM, 3G and Voice calling support. The DOMO X3G 4th voice calling tablet comes powered by 1GHZ Quad core processor paired with 1GB of RAM. It runs on Android 4.2.2 Jelly bean Operating system. You can Make calls from the tablet. The look of the device is similar to that of Canvas TAB, specially from the back. It has Micro USB Host and dock port, 3.5mm audio jack, HDMI and micro SD card slot that can take up to 64GB of memory card. The Slate X3G 4 houses a 3200mAh battery which offers 120hours of standby time. It is 10mm thick and weighs 315 grams. The Domo Slate 4th comes with 7-inch capacitive touch screen display having resolution of 1024×600. It has 1GB RAM, 8GB of ROM, powered by 1GHz Quad core processor and runs on Android v4.2.2 OS. The TAB features 3G, WIFI, Bluetooth and HDMI port connectivity. It is capable of making voice calls via in built SIM Card slot. It packs with 5MP rear auto focus CMOS camera sensor, which is capable of recording Full HD 1080p videos and 3MP front facing camera. It also has Accelerometer and G sensor. 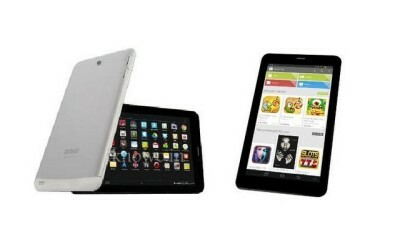 You can Pre Book DOMO SLATE X3G 4TH from online retailers for price of RS 9999. It comes with 6 months onsite warranty and 16GB memory card, tablet stand and Sleeve (worth RS.2500) absolutely free. Bright display, Realistic color, Lightweight, stylish are its fantastic qualities.This is my first android tablet.Applications of the tablet already installed are excellent. I thing this tablet gives better performance to me than any other.Video quality is average. In budget. Its easy to use features are good like Operating system, Quad Core processor, touch is good, I would recommend to other's you can go for it for this price don't expect more. Its a Quad core processor, which ensures that there is no lag in it, all the high spec games can be played without any lag.Overall i would definitely rate excellent. Awesome Device. Nice quality of camera, looks are dashing and bright.Enhances your personality in-front of people.Overall, good to have it. This Tablet Seems Superb with great configuration for such a cheap price i think i should go for it! This device actually manipulates everything.I use it like my phone.Superb battery backup, nice picture quality.